A small selection of fresh middle-eastern cuisine is prepared in this food truck, like falafel and chicken shawarma. Assorted Baklawa stuffed with pistachio or cashew nuts. Lebanese or Nablsieh kinafe drizzled with sugar syrup either served on a plate, or inside a kaake. Kinafe dough stuffed with ashta cream and drizzled with sugar syrup. A daily assortment of cakes available on display. A daily assortment of cookies available on display. Baked baklawa dough stuffed with ashta cream, coated with sugar syrup & topped with crushed pistachio. Fried baklawa dough stuffed with astha cream, coated with sugar syrup & topped with crushed pistachio. Chick peas, tahini sauce & virgin olive oil. 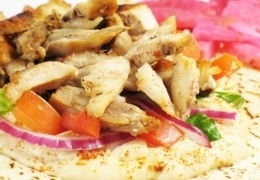 Hummus with your choice of beef or chicken shawarma drizzled with olive oil. A mix of ground chick peas & vegetables fried in vegetable oil. Fresh garlic & onions cooked in a homemade tomato sauce. Fried eggplant, diced tomatoes, green & red peppers, onions & chick peas mixed with a homemade tomato sauce. Fried onions & cooked brown lentils mixed with basmati rice. Fresh chopped parsley, craked wheat, diced onion & tomatoes mixed with lemon juice & virgin olive oil. Romaine lettuce, Kalamata olives, tomatoes, green peppers, feta cheese & red onions tossed in a yasoo dressing. Romaine lettuce, tomatoes, cucumber and green peppers tossed in a balsamic dressing. Three golden pieces of falafel with fresh parsley, onions, turnips, pickles, tomatoes & tahini sauce, wrapped in pita bread. Chicken shawarma with shredded lettuce, pickles & garlic sauce wrapped in pita bread. Beef shawarma with fresh parsley, onions, turnips, pickles, tomatoes & tahini sauce wrapped in pita bread. A kafta skewer grilled on a charcoal barbeque with hummus, fresh parsley, onions, turnips, pickles & tomato wrapped in pita bread. A chicken Shish tawouk skewer grilled on a charcoal barbeque with shredded lettuce, pickles & garlic sauce wrapped in a pita bread. A striploin skewer grilled on a charcoal barbeque with hummus, fresh parsley, onions, turnips, pickles and tomatoes wrapped in pita bread. A lamb skewer grilled on a charcoal barbeque with hummus, fresh parsley, onions, turnips, pickles & tomatoes wrapped in pita bread. Mediterranean spiced beef sausage grilled on a charcoal barbeque with hummus, fresh parsley, onions, turnips, pickles & tomato wrapped in pita bread. A beef patty topped with lettuce, tomatoes & pickles. A chicken patty topped with lettuce, tomatoes, pickles & a side of mayonnaise. Pita bread stuffed with a mixture of ground beef, chopped onions & parsley garnished with mixed pickles, tomatoes & lettuce with a side dip of hummus. Six golden pieces of falafel garnished with mixed pickles, tomatoes & lettuce served with a side dip of tahini sauce. A beef patty topped with lettuce, tomatoes & pickles served with French fries & coleslaw. A chicken patty topped with lettuce, tomatoes, pickles served with French fries, coleslaw & a side of mayonnaise. All of the below authentic recipes are served on a plate with your choice of French fries or white rice, a side of lettuce, tomatoes, mixed pickles and a basket of our home made pita bread straight from our wood burning oven. Beef shawarma with a side dip of tahini sauce. Two skewers of marinated chicken breast grilled on a charcoal barbeque with a side dip of garlic sauce. Two skewers of seasoned striploin beef grilled on a charcoal barbeque with a side dip of hummus. Two skewers of seasoned lamb grilled on a charcoal barbeque with a side dip of hummus. Two skewers of spiced ground beef grilled on a charcoal barbeque with a side dip of hummus. Skewer of BBQ beef, skewer of shish tawouk & skewer of kafta grilled on a charcoal barbeque. Garnished with grilled tomato & onion, a piece of spicy bread served with a side dip of garlic sauce & hummus. Marinaded chicken grilled on a charcoal barbeque with a side dip of garlic sauce. Two skewers of spiced beef sausage grilled on a charcoal barbeque with a side dip of hummus. Spiced minced beef sausage topped with melted Accawi cheese. Sliced mortadella topped with melted Accawi cheese. Dried yogurt mixed with wheat, tomatoes & onions. Kishek topped with spiced ground beef. Diced grilled chicken flavoured with spices & topped with melted Accawi cheese. Chopped onions & tomatoes mixed with our homemade spicy sauce. Tomato basil sauce with black olives, mushrooms & green peppers topped with melted mozzarella cheese. Tomato basil sauce & beef pepperoni topped with melted mozzarella cheese. Tomato basil sauce with beef pepperoni, mushrooms, green peppers & black olives topped with melted mozzarella cheese. Caesar garlic sauce & chicken shawarma topped with melted mozzarella cheese. Butter chicken sauce & chicken shawarma topped with melted mozzarella cheese. Beef Shawarma, peppers and onions, topped with melted mozzarella cheese. A mix of cooked chick peas, fava beans, Lemon juice & fresh garlic served with a side of vegetables. A mix of cooked chick peas, hummus sauce, crispy fried pita bread, topped with melted butter & fried nuts served with a plate of vegetables. Two over hard eggs with a side of vegetables. Two over hard eggs, sausage & a side of vegetables. A two egg omelet with a mix of bell peppers, onions & parsley served with a side of vegetables. A two egg omelet with a mix of bell peppers, onions, parsley & sausage served with a side of vegetables. Seven kafta skewers, four shish tawouk skewers & four BBQ beef skewers, garnished with mixed pickles, tomatoes & lettuce. Fattoush, Chicken and Beef Shawarma, two kafta skewers, two shish tawouk skewers, two BBQ beef skewers, four falafel pieces, garnished with mixed pickles, tomatoes, and lettuce. Twelve BBQ beef skewers garnished with mixed pickles, tomatoes & lettuce. Sixteen kafta skewers garnished with mixed pickles, tomatoes & lettuce. Twelve shish tawouk skewers garnished with mixed pickles, tomatoes & lettuce. It sounds like a cross between a movie theatre and a gourmet food shop but it’s neither. It’s a temple of Lebanese comfort good and baked goods on Yonge St. just south of Dundas. Itstake on shish-taouk nestles meaty skewers on a heaping family platter with all the trimmings.